Brothers Nzinga and Bangori comprise the “bachelor troop” at the Santa Barbara Zoo. All-male “bachelor troops” play a critical role in the development of young male gorillas. In the wild, teenage males leave their birth families and join a bachelor troop until they are old enough to establish a family troop of their own. Nzinga and Bangori had reached that developmental phase with their previous troop, and needed to be on their own. They are not ready to be troop leaders yet, but will be in the next five to ten years. The scientific name for Western lowland gorilla is: Gorilla gorillagorilla. They are 4–5.5 feet tall when standing on two legs and can weigh more than 400 pounds. The Training Wall allows Zoo guests to view keepers interacting with the gorillas during training sessions. Similar walls are used in both the African lion enclosure and in the Amur leopard exhibit. Additional training takes place behind the scenes in the apes’ holding area. Keepers work with the gorillas on a number of behaviors, including allowing their teeth to be brushed, and for voluntary ultrasounds of their hearts. The latter is critically important as heart disease is the number one cause of deaths among gorillas, especially males. 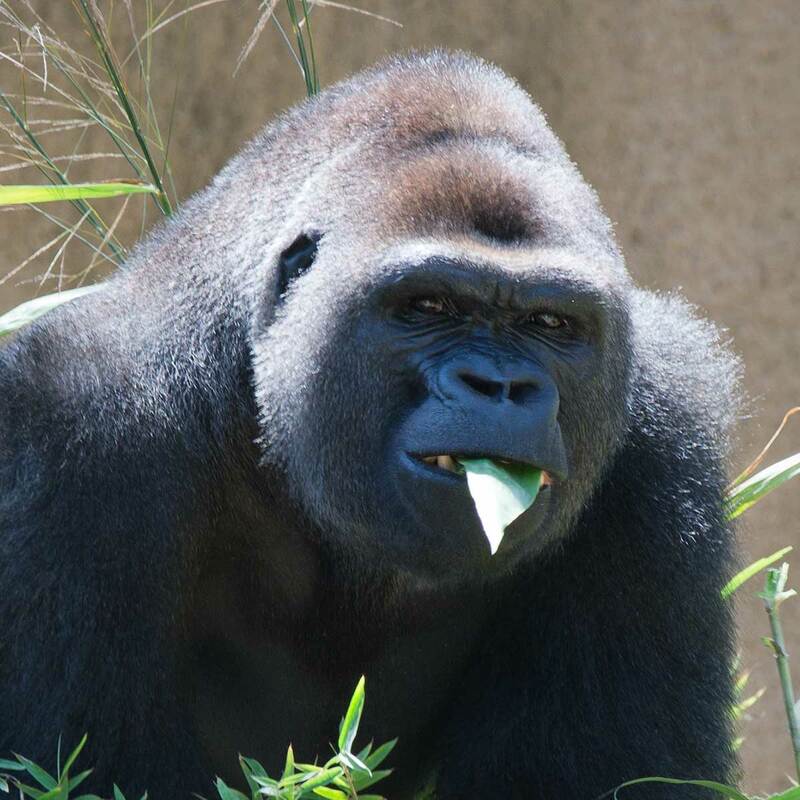 Food isn’t simply given to the gorillas: it is often thrown around or hidden in their exhibit, causing the animals to forage, much like they would in the wild. Puzzle feeders with food inside are sometimes hung up in the exhibit, so the gorillas must manipulate the feeders in order to get the food out. ”Nzinga is eager during training and catches on quickly to new behaviors, but because he is so perceptive, we have to keep an eye on him as he likes to test our boundaries. Bangori is more motivated by spending time with keepers than he is by working through behaviors for extra treats. He does great when things are easy, but when he has to put in some effort, he suddenly becomes distracted by the hair on his arm or picking his nose. In this video you will see a Gorilla choose the ingredients for making beer at the world famous Santa Barbara Zoo’s “Zoo Brew” event. The IUCN Red List notes that the Western lowland gorilla is critically endangered, and cites two major drivers of their rapid decline: poaching and the Ebola virus. 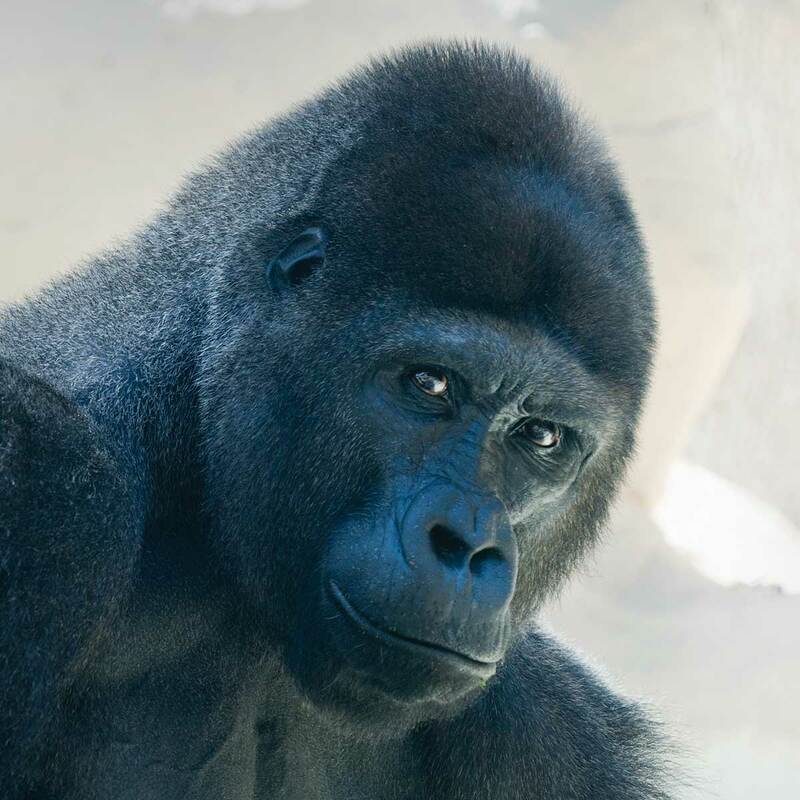 By recycling your cell phones, iPods, and hand-held games in our ECOCELL drop boxes, you reduce the need for minerals mined in and around gorilla habitat. This helps protect gorillas and their environment, and funds important research.